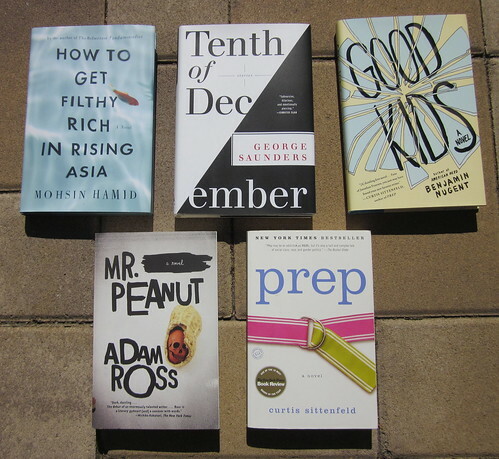 Because it was my birthday last week, as well as to celebrate reaching the end of my revision, I went out and bought myself some books at my two favorite local bookstores, Books Inc in Mountain View and Leigh's Favorite Books in Sunnyvale. Not that I need any more books, or have any room left on my shelves. I'm going to have to do a bit of culling and give some of my old books to the library in order to fit these new ones. And while I expect to read some of these soonishly, others may sit on the shelf for years before I get to them. And, yeah, I'm already in the middle of a couple books on my Kindle right now, and plan to buy a few more recent releases in digital format, but I'm not giving up on paper yet. 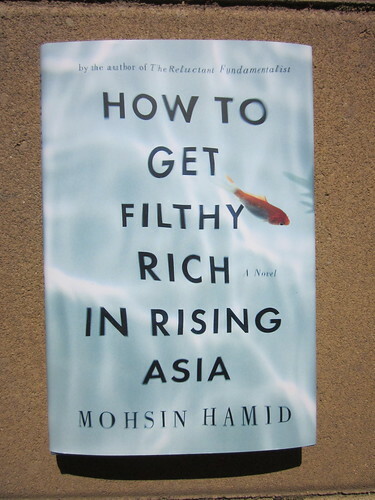 → HOW TO GET FILTHY RICH IN RISING ASIA by Mohsin Hamid, in addition to having a cover that makes me want to dive in, keeps intriguing me the more I hear about it. It's written with the unusual second person narrator and pretends to be a self-help book. I listened to a Fresh Air interview with the author and have come across praise from several critics. I'm looking forward to reading this one soon. → TENTH OF DECEMBER by George Saunders was proclaimed "the best book you'll read this year" by the New York Times Magazine. This was at the beginning of January. That's a pretty impressive piece of hype to live up to, but I do think I'm going to enjoy this short story collection after listening to Saunders interviewed approximately everywhere, including The Colbert Report and Bullseye. → A couple of months ago, I read and linked to an essay by Benjamin Nugent and learned about his debut novel, GOOD KIDS. The story sounded entertaining, so I added it to my to-read list, and when I spotted it in the store, I read the first page and decided to go ahead and buy it. → The folks at Bookrageous, one of my favorite podcasts, have raved repeatedly about MR. PEANUT by Adam Ross, so I've been meaning to read it a couple of years now. I figured if I picked up a copy, that might be marginally more likely to happen. → I have been kind of interested to read every book by Curtis Sittenfeld, and she was on my mind because she has a new book coming out soon. The one that appeals to me most is PREP, and when I saw it in the store, I thought it was finally time to give her work a try. When my order comes in, I'll need to go back into a bookstore. And maybe I'll just have to come home with a few additional books. → John Barnes explains how to Diagnose and Treat Lifeless, Wandering, and Other Problem Dialogue: "In good dialogue, as often as possible, (1) A character makes a demand on another, (2) the other character's response shows that the demand either fails or succeeds, and (3) both characters have a reaction to the way that the demand and response changed the relationship." Thanks, Anna! I just can't resist a nice cover.